Many students believe living in a huge city with many corporations such as Berlin, Munich, Hamburg or Frankfurt would work in their favor. But it often does not. Simply because the bigger the city, the more the jobs, the more applications, the more competition, the lesser probability of you finding one easily. Not only you, but students from all over Europe could be looking for student jobs or internships in Germany. (For the sake of ease, I talk about student jobs(working student) and internships both). In Germany, a working student is often seen as a trainee who works on day-to-day projects for the length of their studies. While an internship is usually time restricted and focuses on one or two projects, a working student role is often ongoing and involves various broad tasks and projects. Second, working students are normally paid by the hour(9-15€), enjoy paid holidays (pro-rata basis) and contribute to compulsory social insurance (pension) and taxes if required. 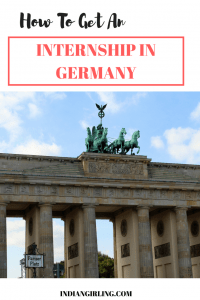 Interns on the other hand are usually given a fixed sum each month, which could fluctuate anywhere between 450-1500€ gross per month, depending on the firm and type of internship, have very few holidays and pay taxes. Third, your chances of converting your role into a full-time one are more or less the same depending on how awesome you were at what you did and how badly they need you. Read Next: How hard is the German language? Indeed: The most comprehensive list for German and English jobs, both part-time and full time. Subscribe to search alerts in your area depending on the type of job you’re looking to find. expatjobseeker.de- Expat Jobs in Germany: A great job-board categorised on native language speakers to find jobs in Germany. You can also post your resume for free. Erasmus Intern: Specifically for internships. Bonus- You may also be eligible for the Erasmus Scholarship(at your university) once you find one here. Graduate Land: Great for recent graduates and internship seekers, specifically for English speakers looking for a wider audience in Europe. LinkedIn Jobs: Belongs to LinkedIn, need I say more? Step Stone: Much like LinkedIn in terms of coverage, minus the networking. The Local: For expat specific jobs from all over Germany. Also includes news, cultural blips and overall a good newsletter to have for your time in Germany. As I have mentioned in various other posts, the more you know the better. However, there are many jobs available that do not require you to speak German necessarily. Good English is sufficient, provided you have the other desired skills. The majority of jobs in any country will be in its respective local language. Germany is no different. Again, highly different based on large, medium and small-scale firms. Most follow a screening process where you apply online with your CV and cover letter, and in case you are shortlisted, an interview is arranged. Usually there are at-least 2 interview rounds, including a telephonic round with your HR/Manager, a video call with a Senior Manager and one or two more face to face rounds. Some firms have up-to 8 interviews, but they usually have a round on technical or skill-assessment. It does you good to research the application process of whichever firm you are shortlisted for so you have ample time to prepare and are not blind-sighted. Don’t be afraid to ask for the wage you deserve. If you know what your market worth is like, by all means negotiate your final pay. After all, as a student each penny counts and you will be using considerable time away from your studies to work for which you must be aptly compensated. Keep a close track of the 120 full days/240 half days rule, unless you have a special pre-approved exception or work as a student assistant at the university. Once you exceed this, you can get into a LOT of trouble with the Foreigner’s office, and in some cases also forced to go back home. When wondering how formal to be with your colleagues at work, the more formal you are the better. Do not dress up shabbily, even if you work at an IT firm where everyone turns up in shorts and cartoon t-shirts. By all means, dressing well never hurts your image. Of course, this doesn’t mean you should be in a business suit while everyone else comes in a t-shirt, but while you’re there, look sharp. Break the ice in your interview with some German. Ideally, you should be able to give a strong introduction if need be, and explain what you have been doing in the past or a summary of your resume. The fluency doesn’t count (unless the post specifically requires so), but your attitude towards speaking a foreign language will. Make sure you apply for your tax return if your earnings exceed the minimum taxable threshold (between 8000-9000€). ‘I hate that I have some extra money’- said no one ever. No matter what, stay true to yourself, confident and put on a great show! If you’d also like to read the best way to apply for a job in Germany, read the detailed guide here! Makeup Essentials For Busy Girls- Get Going in 10 Minutes! Hey Alex. Thanks a lot for the shout out. And congratulations yourself. Cheers!